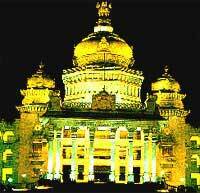 Bangalore city is located in the southern part of the state of Karnataka, in the southern region of India. It is 3,113 feet (949 m) above sea level, on top of a ridge in the Karnataka plateau. The climate of Bangalore is moderate and pleasant. Summers are mild (April-June) and winters are cool (October-February). The city experiences southwestern monsoon rains in June-August. Legend has it that the city is named after an old woman, who lived in this area and offered a humble meal of boiled beans to a lost Hoysala ruler. The origin of the present-day city of Bangalore can be traced to the early 16th century, when Kempegowda, a local chief, built a small mud fort here. Bangalore gained prominence in the 18th century, when it became an important fort city, under Hyder Ali and Tipu Sultan of Mysore. 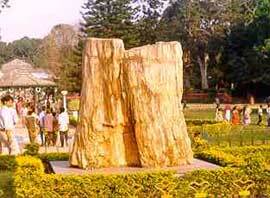 Bangalore city has a number of tourist places. Apart from the numerous gardens, it also has some historical sites and other places of interest. The Vidhan Sabha or the State Secretariat, built in 1954, is the main attraction of this city. It is a marvel of modern architecture and is a fine amalgamation of traditional Dravidian and modern styles. Cubbon Park, the 120-hectare park located near the Vidhan Soudha, has a number of neo-classical styled government buildings. The Government Museum of Bangalore (one of India's oldest museums) and the Visvesvaraya Technological and Industrial Museum are important museums within the city. The Lal Bagh Botanical Gardens, which holds a number of flower shows, especially during the Republic Day (26th January), is located on the southern fringes of the city. The 18th-century Tipu Sultan's Fort and Palace are other important places of interest to the traveler. The 16th-century, Dravidian-styled temple dedicated to Nandi the Bull is an important place of worship. The Venkataramanaswamy Temple, the Gavi Gangadhareswara Cave Temple, and the Someshwara Temple are other important temple of this city. The Ulsoor Lake on the northeastern edge of the city is an important picnic spot. Bangalore city is famous for it numerous Yoga centers, where fitness freaks can learn and practice this ancient art of keeping healthy. There are a number of places of tourist attraction near Bangalore. Thirty kilometers from Bangalore is the Nrityagram village, housing a classical dance academy. Bannerghatta National Park, 21 km from the city, is an important place to visit. Sixty kilometers from Bangalore is the Nandi Hill Resort, which is also famous for its temples and fort. Devarayandurga, 70 km from Bangalore, is famous for its hilltop shrines. The craggy rock formation around Bangalore offers adventure activities like trekking and rock climbing to the adventure seeker. Devarayandurga (70 km), and Ramanagaram (49 km) are important spots for adventure. The Doda Alada Mara, a 400-year-old banyan tree lying 28 km from the city, is an idyllic place for picnics. Mekedatu, 98 km south of Bangalore, and Muthyalamaduvu, 40 km from Bangalore (also known as the Pearl Valley), are other important picnic spots. The historic city of Mysore is 139 km from Bangalore and offers to the traveler a number of monuments belonging to Hyder Ali and Tipu Sultan, the erstwhile rulers of the place. It also has a number of ancient Hindu temples and a few monuments built by the British. Whitefield Ashram, the summer abode of the Shri Sathya Sai Baba, 20 km east of Bangalore, and the ISKCON (International Society for Krishna Consciousness) Temple Complex are important spiritual centers, worth paying a visit. This cosmopolitan city is a heaven for shoppers, as it offers both traditional and modern items to the traveler. It is a good place to buy traditional handicraft items, such as silk saris, intricately carved sandalwood items and tribal jewelry. Bangalore is famous for its sandalwood cosmetic products and toiletry. These traditional items can be purchased from many outlets and emporia on MG road. There a number of shopping arcades across the city for the traveler to window-shop and buy things. Bangalore Airport is 13 km east of the City Station. There are number of daily flights to important cities like Calcutta, Mumbai, Delhi, Hyderabad, Chennai, Ahmedabad, Goa, Kochi, Mangalore, Pune and Thiruvananthapuram. Bangalore has direct international flights to Muscat, Sharjah and Singapore. It is also a stopover for many international flights. Bangalore has a large bus terminus, which is near the railway station. The Karnataka State Road Transport Corporation (KSRTC) buses and buses belonging to Tamilnadu and Goa Roadways also operate from here. There are two railway stations in Bangalore. The main station is well connected to all major Indian cities. There are number of daily express trains from Bangalore to other cities of India.